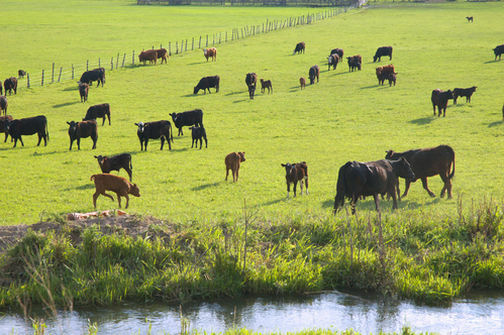 To raise quality grass fed beef you not only need green pasture grass but natural live springs for the cattle to naturally grass and drink from. Dierks Farms has both of these on many places on their farms. Live springs are a natural way of our cattle drinking water. The live springs are a continuous flow of clean water for our herd to drink from and add to their stress free life. Imagine being able to roam, as you want, eating of your favorite food and drinking from a forever-clean water source. You have no boundaries within the pastures of Dierks Farms. What a life it would be. This is the life of one of the Dierks Farms herd. Our cattle are happy cattle and due to that they also create healthy beef. We raise cattle the natural way. We use no antibiotics and feed absolutely no grain to our cattle. Our cattle rotate pastures on a routine basis to insure that they always have the freshest grass possible to graze on and the freshest water supply available by drinking from our live springs. When we check on our cattle we find them as they roam the over 300 acres of pasture that is available to them. Are you are looking for grass-fed beef from a family farm that raises beef the natural way? Dierks Farms raises beef the natural way, not the fast way. We raise cattle in our opinion the right way…. the healthy way for you and your family. Dierks Farms…we are “Americas Grass-Fed Beef”. We would love to share our healthy grass fed beef with you. Please visit our website and learn even more about our family and our grass fed beef. Our farm ships our grass fed beef anywhere in the continental US. Click here to visit our website.